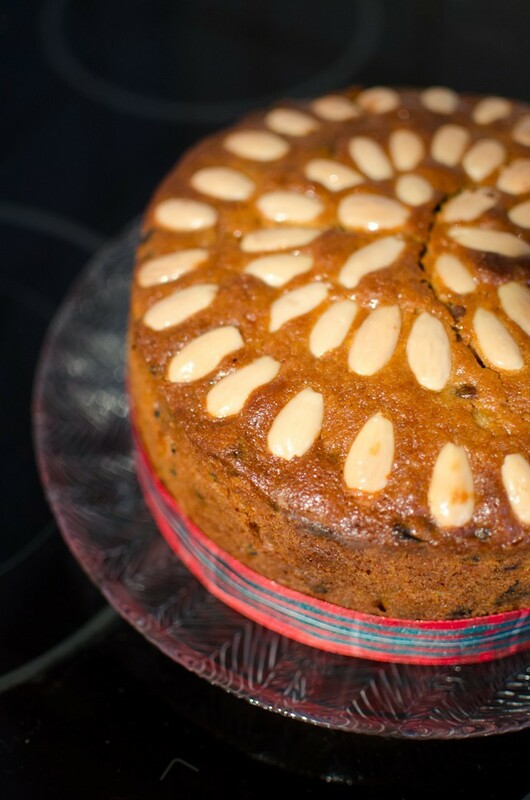 This is a recipe for a traditional Dundee cake with a texture lighter and crumblier than the Christmas-type fruit cake and a lovely flavour. It takes a while to bake during which it needs some attention but not constant. 100g blanched almonds for the top. A day or two before you want to make this cake, weigh out the dried fruit and splash over some sherry, whisky or rum, cover with cling film and leave until ready to make the cake. Prepare the tin – this is very important as it will stop the cake from sticking and burning. Line a 20cm (7.5 to 8″) tin with a double layer of greaseproof paper, including the bottom, and grease well. Round the outside of the tin wrap folded over newspaper and tie with string to hold in place. Sit the prepared tin on more folded over newspaper on a baking tray. Preheat the oven to 170 degrees (150 if fan). Beat the butter and sugar in a bowl until very fluffy. Whisk in the eggs one at a time with a tablespoon of flour between each addition to prevent curdling (it will also help if the eggs are at room temperature). Now add the marmalade or apricot preserve if using and orange zest; make sure it is soft and bit on the runny side by whisking, possibly with the whisky, before adding to the mixture otherwise you will end up with lumps (see – this is what happened to me!). Now fold in the flour (reserving a couple of tablespoons – see next step), ground almonds and baking powder with a large spoon. The mixture at this stage should be stiffer than your average sponge batter, otherwise the fruit will sink. That reserved flour, sprinkle it over the dried fruit and glace cherries (this stops them from sinking) then fold all the remaining fruity ingredients into the batter. Put the blanched almonds into a bowl and cover with boiling water while you spoon the mixture into the prepared cake tin, smooth the top and press a very slight concavity into the middle of the cake (so when it rises the top stays level). Drain the almonds and dry on kitchen paper. Next, arrange the almonds in concentric circles on the top of the cake, starting in the middle. Do not push them in when you do this otherwise they will sink into the cake while cooking. Make a foil hat that sits on top of the paper that surrounds the tin and put the tin in the oven, middle or bottom levels. It will need 2 to 2 and half hours, until a skewer comes out almost clean (err on the side of slight under doing as it will continue to cook for a bit as it cools and you don’t want a dry cake). Keep the hat on the cake until the last half an hour of cooking as this will stop burning and cracking. When you take the cake out of the oven, brush the top with a sugar syrup made from a tablespoon of water and a tablespoon of caster sugar and put back in the oven for 5 minutes to dry this then repeat the syrup but leave out of the oven. Leave the cake to cool completely in the tin. This cake keeps very well for a week or more in an airtight tin and the flavour improves after a few days. Enjoy! Can you give some insight as to the texture of the outside of the cake? I’ve just baked one and it doesn’t seem to be as soft on the outside as a traditional American cake and I’m curious to know whether that is typical with this cake? Thanks! Hi. I have no idea what a ‘traditional American Cake’ is and therefore what the texture is! It is most certainly not like a sponge cake on the outside. Any heavy fruit cake that is cooked long and slow develops a sort of crust, like bread, due to the caramelisation of the sugars on the outside and the slight scorching of the fruit, no matter how many layers of newspaper you wrap around the outside to protect it! I think the crust is partially what gives the cake the long keeping qualities. You could always soften it by feeding it with some booze. Hope that helps! Perhaps this sort of fruit cake is a typically British thing? Anyone know? should Dundee cake be dry? Not dry but also do not expect it to be a moist as a simple sponge.